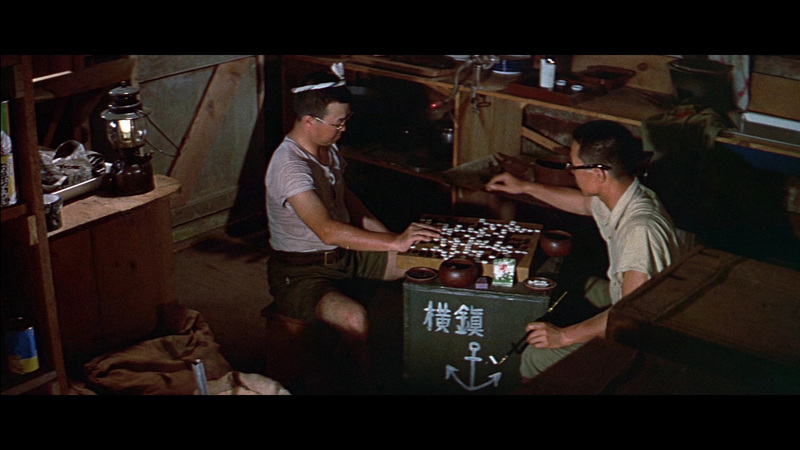 The year is 1944 and we’re in the South Pacific. 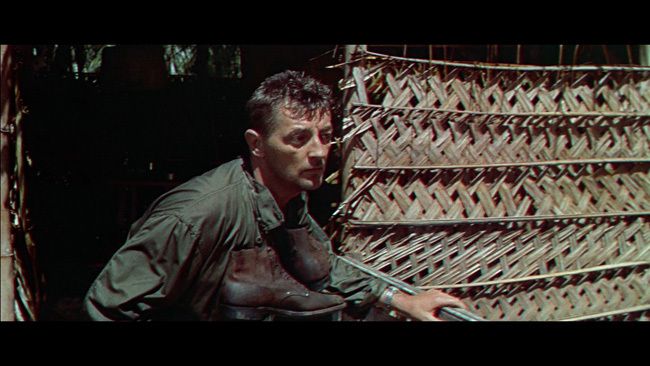 Corporal Allison (Robert Mitchum), having barely survived an attack on his submarine by the Japanese, somehow manages to scramble onto a raft and drift away to safety. 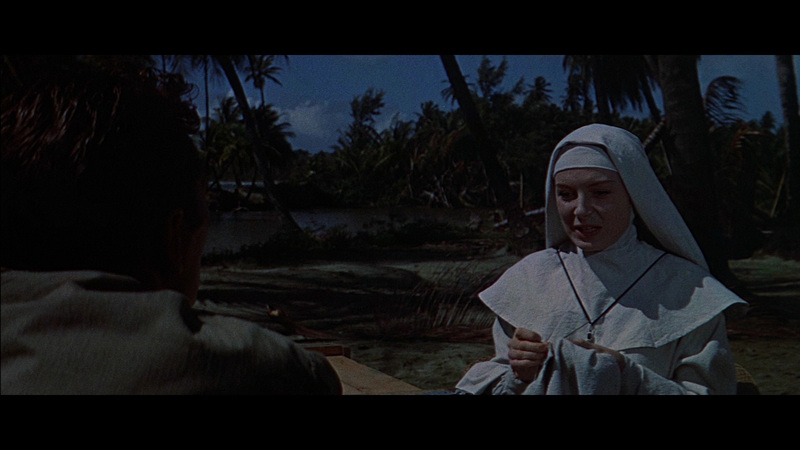 He eventually washes up onto the island of Tuasiva and, in searching for enemy troops, comes across a church occupied by Sister Angela (Deborah Kerr). It turns out that she is the only person on the island after having been abandoned by her transport and the subsequent death of her only companion, an elderly priest. 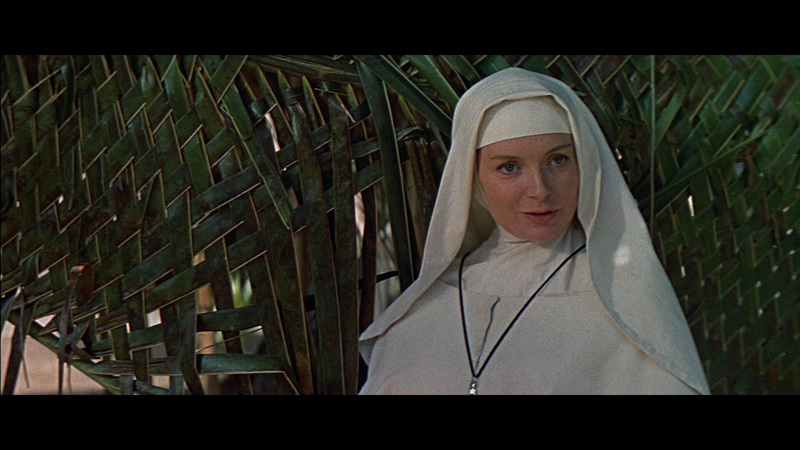 Sister Angela has been there for only four days, having arrived in a last-ditch effort to retrieve another elderly priest that had been stationed at Tuasiva’s mission. 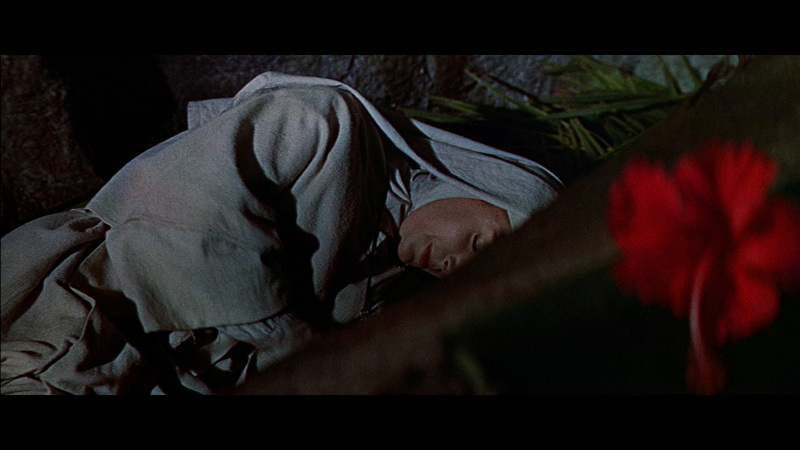 Unfortunately, they had come too late; the Japanese had obviously been there and had presumably captured the priest and conscripted the natives. As the only inhabitants of an abandoned island, Corp. Allison and Sister Angela must now rely on each other to survive. 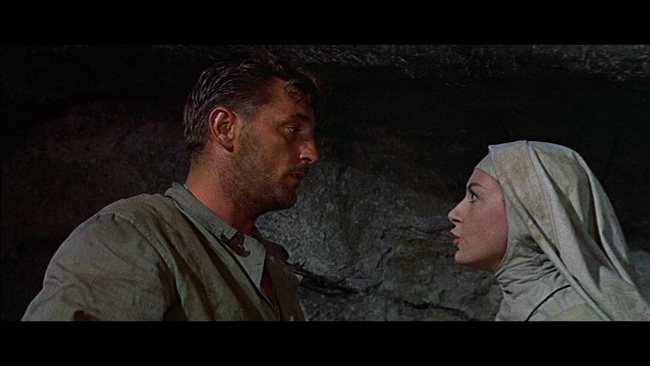 That’s the set-up of John Huston’s Heaven Knows, Mr. Allison and the scenario immediately recalls the director’s previous masterpiece The African Queen, although the book was adapted from a novel by Charles Shaw. There is also a sense of déjà-vu in the casting, with Kerr once again playing a nun, as she so memorably did in Black Narcissus. In addition to this, Mitchum had donned a soldier’s uniform in a handful of his previous film outings. 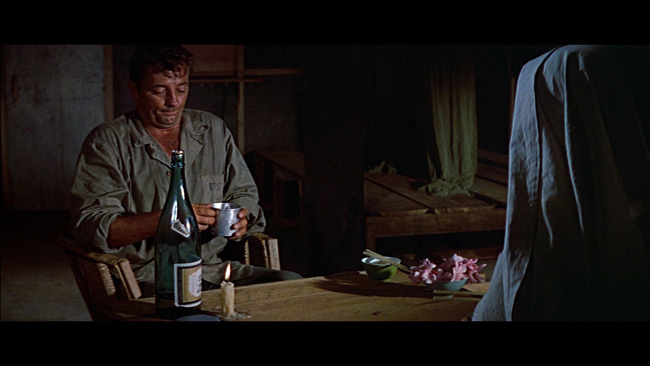 For long stretches of the film, Kerr and Mitchum are the only characters on screen and Huston does a good job playing off Kerr’s articulate and devout Sister Angela with Mitchum’s resourceful and earthy Corp. Allison. The stars have real chemistry, and indeed Kerr and Mitchum would go on to star together in three more films. 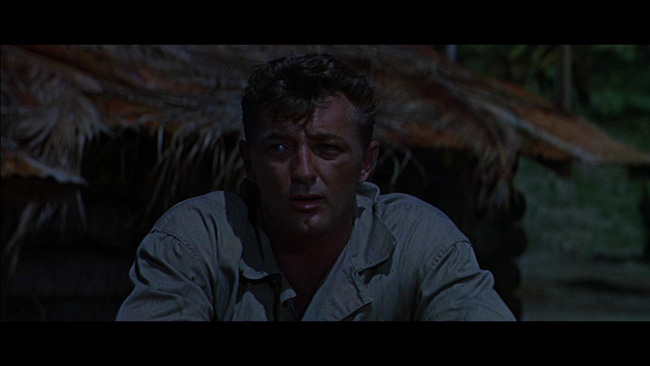 Mitchum would also call the character of Corp. Allison to be the favorite role that he had played in his entire career, which is no small claim given his classic turns in Night of the Hunter and Cape Fear, among many others. It should be stated outright that Heaven Knows is not nearly as good as Huston’s African Queen but it’s a fairly entertaining adventure romp. As is the case in these sorts of films, the tone swings wildly between broad comedy and light suspense. There’s an early sequence of a giant turtle hunt that’s pure slapstick, and indeed the first half of the film is almost in the Swiss Family Robinson mode. 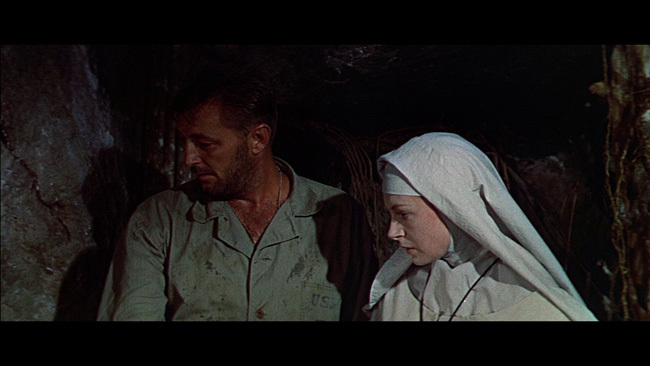 That state of affairs decidedly changes in the second half of the movie, when the Japanese soldiers return to the island and force Corp. Allison and Sister Angela to hide in a cave. The main problem with Heaven Knows is that the film is not as funny and exciting as it might have been; essentially the story is elevated by the two main characters, who are able to sell the obviousness of the material with their excellent performances. As is to be expected, the film plays up the inherent tension in having two disparate personalities on display; the film’s literary source material was subtitled “The Flesh and the Spirit” and you can bet a skeptic like Huston delighted in conflating his castaway marine and his stranded nun. Huston was reportedly very disappointed with the final product, given it had been filmed under the Hays Code (and hence it could not be as risqué as he presumably intended it to be). It is not an explicit film by any stretch of the imagination but there are definitely moments when audiences can read between the lines. 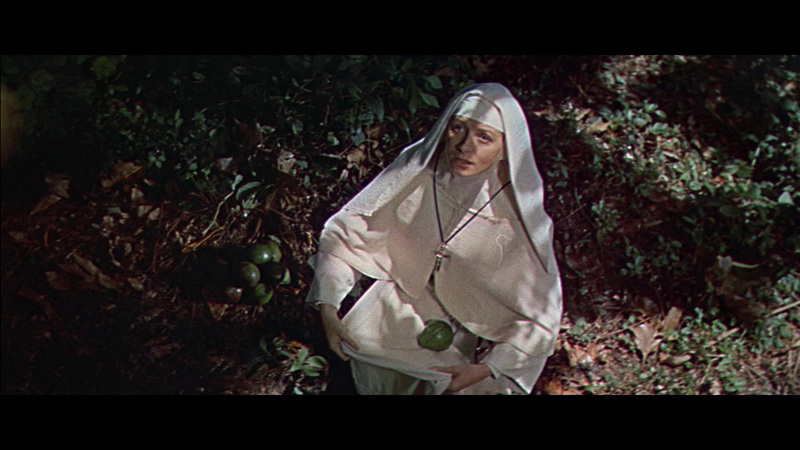 There’s one scene where a drunk Corp. Allison makes a sloppy advance to Sister Angela, saying “we don’t belong to nothing beyond this island. All we got is it and each other, like Adam and Eve.” It’s moments like this that Heaven Knows shines and is recommended viewing for fans of either star and/or of the director. Twilight Time’s blu-ray release of Heaven Knows, Mr. Allison offers a 1080p High Definition transfer in the film’s original aspect ratio of 2.35:1. For a film shot in cinemascope by the talented cinematographer Oswald Morris (who collaborated with Huston on eight other films), the transfer here is mostly muted affair; colors don’t pop the way they should. Although the grain level is good and there’s a moderately impressive presence of detail throughout, the print has some minor but noticeable damage in spots, with the occasional specs showing their unwelcoming presence. None of the issues are major although the cumulative effect is of one wishing that the print was slightly better shape. The audio option on the blu-ray is a lossless English 2.0 DTS-HD track. Unlike the video transfer, the audio on the disc is fine, with no distortion to speak of and good balance. I’m not a huge fan of Georges Auric’s score, which strikes me as unremarkable, although the disc offers an Isolated Music and Effects track that sounds excellent. Unsurprisingly, Twilight Time always do a fantastic job when it comes to the audio aspect of their discs. There are English SDH subtitles on the disc as well. Turning to the extras, Twilight Time have assembled a “Fox Movietown News” feature that culls together a handful of vintage clips that range from awards press coverage to actual news footage from World War II. Taken together the clips run roughly 10 minutes in length and provide an interesting non-fictional context for the main feature. Aside from the aforementioned bonus audio track, there’s a brief Original Theatrical Trailer that begins with Huston himself narrating the voice-over before being overtaken by someone else. Julie Kirgo’s liner notes of TT's releases are always worth reading and are a great blend of commentary and trivia factoids, all delivered by a writer who obviously loves the films under discussion (although her provocative claim of this film's superiority to African Queen admittedly raised my eyebrows). Even middling John Huston is ultimately worth a watch. 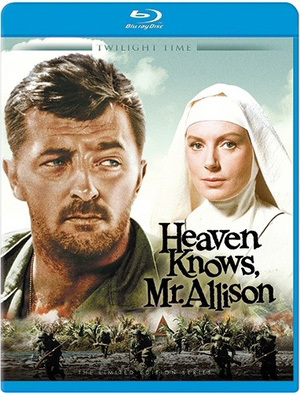 Twilight Time’s blu-ray release of Heaven Knows, Mr. Allison looks fairly good and sounds great. Twilight Time do a good job on the overall package, with their attractive liner notes and light but valuable extras. I can see why Huston was none too pleased with the film but Kerr and Mitchum give excellent performances. A mild recommendation.